However, the ball was never found – which is one of baseball’s biggest mysteries. 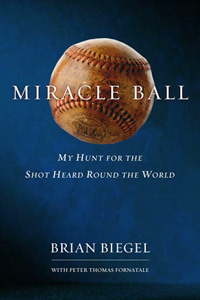 Miracle Ball is the story about the author’s search for the ball. I’d say there are good things and bad things about this book. The hunt for the ball is exciting as hell. It’s like a great mystery movie or a baseball history episode of CSI. This is a true story, and it is so much fun going along for the search and following clues. The guy gets forensic evidence, tracks down long-lost witnesses, has secret meetings with shady New Jersey mobsters…and each time he gets closer and closer to finding this ball. It’s a terrific ride – all the more terrific because it’s a real-life mystery. The author works really hard to portray himself as this struggling hero working to overcome the odds. He suffers from pretty severe depression and spends a lot of time going into how hard it is for him to keep pushing through on this quest. To make matters worse, the guy lives with his parents and the book has detailed conversations where he calls his father “Papa”. Makes you want to puke, right? Me too. But all said and done, it’s a fun read that gets into baseball history in a way that’s exciting. It’s pretty well written too (albeit, by a ghost writer – no surprise). I’d recommend Miracle Ball to baseball fans, non-baseball fans, and most of all to Papas everywhere. Where To Start? I Know Just the Place.